I've been pretty out of it for the past few days, with a really stiff neck, sore body, and a terrible headache. I have no idea what's going on, but aside from that, the important thing is that I still managed to snag some really cheap vegetables at my favorite Bronx fruit stand :-) I have been craving cabbage (no judgement please haha) and they had some for $1.50 so I went for it and haven't looked back since...then I discovered that they also had kabocha squash for a dollar, and got some mushrooms and onions to go along with it for good measure. I hadn't really planned on making dinner with everything I bought, but really couldn't resist, so the following ended up happening...The name makes it sound kind of far out there but the end result is so worth it! If you're not familiar with Kabocha squash I highly recommend you try it! It is one of my favorites, mainly because my grandma plants huge ones in her garden and it reminds me of her. I also just wanted to drop a note: and say that this blogging thing is turning out to be a lot of work, and definitely takes up a significant amount of time, but I love it, and the fact that I am sticking it out this time, which feels great. I am investing a lot into it, but at the same time feel like I am learning so much, especially as far as social media and about the blogging community. Thank you for the support so far! I look forward to the time I have to devote to this blog and interacting with others who have similar interests every day. If you haven't already, please remember to like me on Facebook and follow me on Twitter, thanks again! 2. 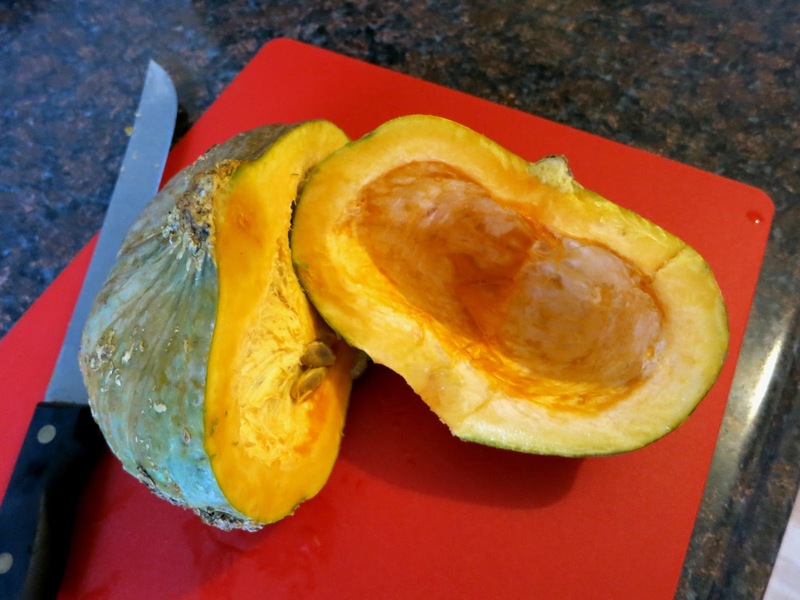 Take half of your Kabocha squash and cut it into strips, parallel with the flesh. This will make the roasting go faster, and make it easy to cut into the salad later on. 3. Grease your baking sheet (I use olive oil in a spray), place slices of squash along with mushrooms on it, sprinkle with salt, and roast for about 30 minutes, until the strips are soft and start to brown. 4. Add 1 tbsp of olive oil to a wok or a pan, and start to sautee your onions on medium heat, adding the cabbage once it has been cut or shredded into thin strips. 5. After draining and rinsing the yam noodles, add them in and cover the pan, allowing noodles to heat and the cabbage to steam a little for approximately 5-10 minutes, checking every now and then to make sure the ingredients are not sticking to the pan. 6. Uncover and continue to sautee, pouring in soy sauce and adding salt according to taste. The more soy sauce you add, the less salt you will most likely need. 7. Once most of the juice from the bottom of the pan has evaporated, remove from heat. 8. 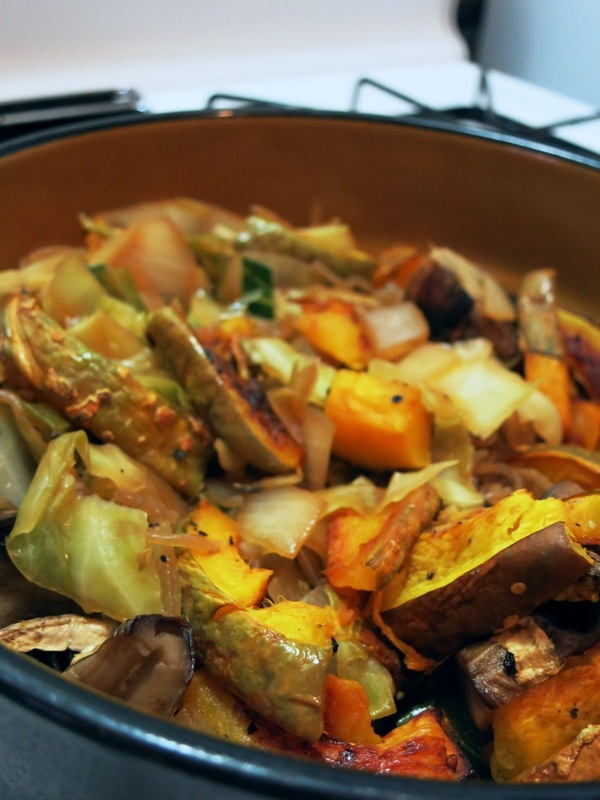 Remove the Kabocha and mushrooms from the oven, and cut into more manageable "salad pieces," or leave intact if you would just like to top the stir fry with them. 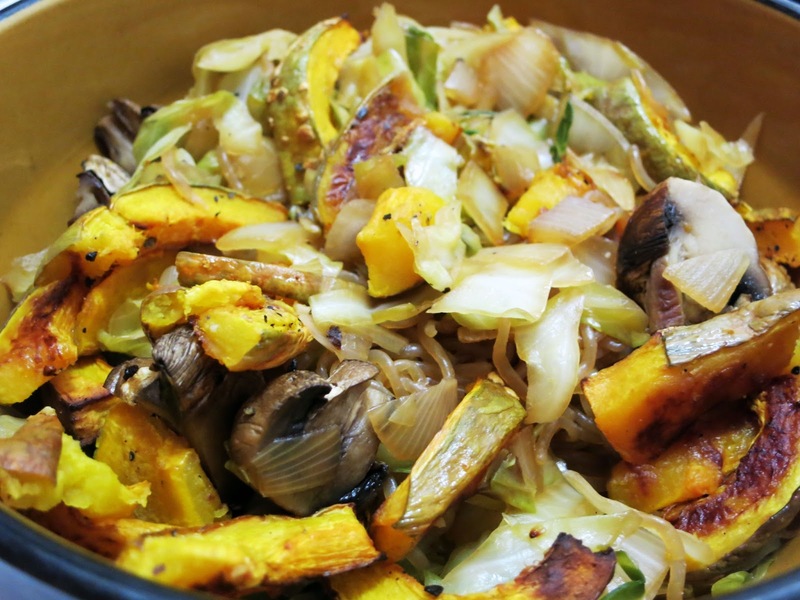 I chose to incorporate them into the stiry fry, so I cut the Kabocha slices into thirds and the mushrooms in half. 9. Mix into to your stir-fry, and serve hot (or cold, which sounds weird but is also amazing). One of my favorite things ever is eating stir fry from a bowl, not exactly sure why, but probably because it reminds me of when I was in high school and would make frozen chicken chow main from Trader Joe's for dinner and then eat it on the couch while watching Friends...haha. Anyways, whichever way you choose to eat it, I hope you enjoy! Great recipe! I think my wife would be interested to this recipe because she really like eating stir fry especially when she got home from work. I will show this to her. Sounds good, let me know how you like it! Thanks for stopping by!